There are days when everything comes together. You feel good, the weather’s good, and planets are all aligned. It’s what Frank Shorter calls a “no excuses” day. And when that day happens on a goal race day you just know something special is going to happen. Yesterday, March 24, 2012, was that kind of day for me. It was one that I will remember for the rest of my life. A little recap. In January of 2010 I did something to my sacroiliac joint. It’s a plate joint, not a ball joint and it was out of alignment. 6 months and weeks of physical therapy and two injections later the pain was manageable. It was about that time that the pain in my foot became really obvious. In September, when I was finally diagnosed with a dislocated cuboid joint the year was officially a write off. In January of 2011 I started the 100 Days Challenge of moving, intentionally, for at least 30 minutes a day every day for the first 100 days. Turns out I kept going and walked at least 30 minutes every day for the entire year. In January of 2012 I committed to getting back to training. I know enough to know that I had to start with reasonable goals and achievable results. 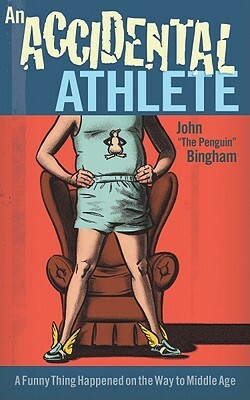 With that in mind I chose the Penguin in the Park 5K as the race for which I would train. I had a very reasonable goal of finishing in 45 minutes. Not world record pace, but for me it was a serious goal. As I spent the first few weeks of the year assessing my fitness and making my training plan it became clear that 45 minutes would not be easy. I couldn’t run for more than one minute and needed plenty of walking for recovery. I had a goal, though, and that’s what mattered. What is sometimes misunderstood about those of us farther back in the pack is that to perform at OUR best we have to do the very same kinds of workouts as those in the front. So, I did long runs and tempo runs and speed work and race-pace runs. I calculated and recalculated. I figured out what it was going to take to finish in 45 minutes and worked hard to get there. Race morning was cool and dry. 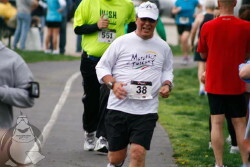 My buddy Jim Welsh had agreed to pace me. As you can see from the photo, Jim’s a lot taller than me. His walk pace is much faster than mine. As it turns out, my run pace was a bit of a push for him. So, together we set out in search of that 45 minute finish. At mile one I was surprised to see our pace. Something around 12:45. I looked up at Jim but didn’t say anything. When we hit mile 2 in about 25 minutes looked at Jim and told him that I hated him. It was clear that not only were we on a sub 45 pace, we were – if we kept at it – on a sub 40 minute pace. It was pretty quiet that last mile. I was at my limit. Maybe Jim was too. Whatever we were feeling we had a monster finish in sight. I came across in 38:45. Jim a second later. We hugged like a Gold Medal relay team. We’d done it. We’d BOTH gotten PR’s. It was magic. What’s the next goal? I’m not sure. I know that I’m going to run/walk the Rock ‘n’ Roll Half Marathon in Virginia Beach on Labor Day weekend. But I’ve got a feeling there’s gonna be a few 5 and 10K’s before then. 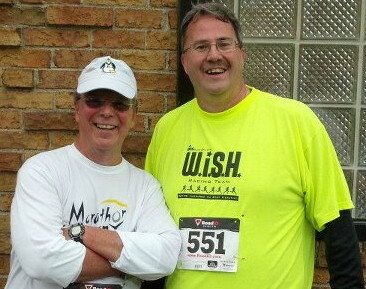 Jim is one of our good friends and I know from experience that he’s a great person to hang with during a race. Congrats! It was an honor to run with you yesterday. I PR’d too! What a great story! If there are two people I’d love to hang with as I attempted a PR, it would be Jim, who I know as a friend, and you, who has inspired me to undertake my running journey!